Trends of upgrading gating systems in iron casting production under the conditions of the existing operation with the purpose of improving casting quality and production process efficiency are shown. Key words: foamed ceramic filter, gating system elements, yield. Ways of changing inoculation technology for high-strength iron castings under the conditions of the existing operation with the purpose of improving casting quality and cutting production costs are shown. Key words: ladle and in-mold inoculation, complex inoculant, inoculating elements. Raiko O.Ye. 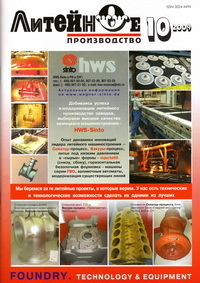 (Molding Materials Laboratory at OAO "AVTOVAZ") Use of Release Agents for Pattern Tooling in Iron Casting Production at MtP OAO "AVTOVAZ"
Last years the Russian research firm of Joint-Stock Company "Litaform" (Moscow) cooperated with the foundry enterprises with a view of creation of dividing coverings for modeling equipment of new generation much. Dividing covering Litaparm has been developed and tested. Experience of application of the developed covering on Open Society "AUTOVAZ" confirms its efficiency. Experience of adopting the LEAN system (lean production) under the conditions of operating production facilities is presented. Effect of using the system's elements is shown. Key words: "5S" (work site arrangement), "TPM" (total preventive maintenance). Results of comparative investigations into wear resistance of pearlitic irons with different graphite shapes under the conditions of dry friction and limited lubrication are presented. Advantages of vermicular graphite iron have been revealed. Recommendations on using the friction pair including pearlitic vermicular graphite iron and hardened steel for lateral supports of diesel and electric locomotive bodies for improving service reliability and life of the structure are given. Keywords: cast iron, vermicular graphite, steel, structure, lateral support, body, diesel locomotive. A mechanism of inoculating titanium aluminides in alumomatrix composites using nanoparticles of SiC and Al203 is discussed. Results of investigations into the materials' structure and properties are presented. The availability of using nanoparticles of high-melting compounds as inoculants for aluminium-based composites is shown. Key words: alumomatrix composites, nanosize particles, inoculation, structure, hardness, wear resistance. The origins and drawbacks of the standard for molding quartz sands are analyzed. Methods of computer-aided determination of sand grain size distribution using electronic tables based on a statistical model of the sand grain distribution law are proposed. Key words: molding sand, sieve analysis, grain size distribution, coefficient of homogeneity. Stress modeling of casting - the important part of shaped casting technical process development. Ignoring of this stage raises risk to obtain such defects, as hot tearing, cracks and warping. Their elimination by practical consideration and "tests and errors" method can be long and inefficient process. This year the Group of companies "CSoft" actively develops such a Stress model of cooling casting taking into account it's contact with mould. This model will be shortly included in "PoligonSoft" casting simulation software as one of solvers. In article some results of test calculations are presented. The article analyses the nature of cracks in magnesium alloys in thin-walled panel castings, obtained by die casting. The plastic possibilities of intermetallic phases, based of magnesium are determined. There is the example of high crack-resistance magnesium alloys producing for die casting. Two kinds of melt movement behavior - laminar and turbulent - in centrifugal casting (CC) are discussed. When braking the CC mold, the laminar melt movement behavior changes to the turbulent one, resulting in a change in crystallization conditions and formation of structural inhomogeneity in the casting, and in a higher content of nonmetallic inclusions. Key words: casting mold, centrifugal force, structural inhomogeneity, nonmetallic inclusions, crystallization.